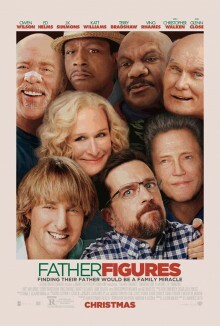 Owen Wilson and Ed Helms star in the Alcon Entertainment comedy “Father Figures,” marking the directorial debut of veteran cinematographer Lawrence Sher (“The Hangover” films). Wilson and Helms are Kyle and Peter Reynolds, brothers whose eccentric mother raised them to believe their father had died when they were young. When they discover this to be a lie, they set out together to find their real father, and end up learning more about their mother than they probably ever wanted to know. Join LatinoScoop at an exclusive advance screening of FATHER FIGURES in select locations below. Click on the link below for your city and enter the code. If you download a screening pass and aren’t able to use it, please share it with someone who can attend. There are limited number of passes available for each location. Screening passes are available on a first-come, first-serve basis. Additional passes will not be added once they are all redeemed. All advance screenings will take place on Tuesday, December 19. Anyone downloading a screening pass is advised to arrive early to secure seating. The theater is intentionally overbooked by the studio to ensure a full house. Plan accordingly to arrive with enough time.